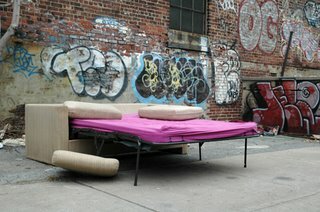 The Gowanus Lounge: Affordable Furnished Williamsburg Studio--Perfect for Spring/Summer! Affordable Furnished Williamsburg Studio--Perfect for Spring/Summer! Gigantic, Huge, Sunny, Airy and Spacious are just a few of the words to describe this furnished Williamsburg studio. Decorated with cutting-edge street art, unbelievably high ceiling, ground floor (no climbing! ), exposed brick, FULL of light, unlimited living space, almost like living in the country! Excellent, hip and artsy ambience. Right in the thick of things. Just two blocks west of the Lorimer L and immediately adjacent to the cozy, dry BQE overpass. Immediate occupancy. Aggressive, fearless cats welcome (purr). Short- or long-term lease. Under $1,000!!!! !